The opening session of the 2013 Strategic and Economic Dialogue. Ahead of this year’s Strategic and Economic Dialogue, the U.S. and China are trying to stay positive. It’s been a rough year so far for U.S.-China relations. In the early months of 2014, the U.S. and China were still dealing with the fall-out from China’s decision to establish an air defense identification zone (ADIZ) in the East China Sea, and from Japanese Prime Minister Shinzo Abe’s controversial visit to the Yasukuni Shrine (which prompted complaints from China that the U.S. should do more to rein in its ally). Since then, the U.S. indictment of PLA officers for cyber-espionage and U.S. support for Japan’s defense reforms have irked China. Washington, for its part, has sharply criticized what it sees as Chinese aggression in the South China Sea and in cyberspace. With so many points of friction attracting so much vocal attention from Beijing and Washington, one veteran China hand told me he was more pessimistic about the future of U.S.-China relations now than he had been since Nixon’s visit to China in 1972. All in all, the dream of a “new type great power relationship” between the U.S. and China seems much less achievable than it did last year, in the immediate aftermath of Obama and Xi’s informal summit in California. Tensions have been bad enough recently to spill over into high-level diplomatic meetings, which are usually restricted to bland platitudes. U.S. Defense Secretary Chuck Hagel traded barbs with Chinese Defense Minister Chang Wanquan in Beijing. Later, at the Shangri-La Dialogue, Chinese Lt. Gen. Wang Guanzhong had more pointed words for Hagel and Abe as he refuted their criticisms of China. With another round of high-level meetings looming, this year’s Strategic and Economic Dialogue (S&ED), both China and the U.S. are trying to set up a more conciliatory atmosphere. Both China and the U.S. want to emphasize the positive in the lead-up to the S&ED, scheduled to take place in Beijing July 9 and 10. Xi Jinping held a meeting with former U.S. Treasury Secretary Hank Paulson in a clear attempt to build up some positive momentum before the talks. During the meeting, Xi said that China takes a long-term strategic view of the U.S.-China relationship, and will not allow it to be derailed by short-term issues. He urged both sides to inject “positive energy” into the relationship. There has also been some public positivity from the United States. A reporter from China Daily asked Deputy National Security Advisor Ben Rhodes for his thoughts on the U.S.-China relationship during a press conference on Tuesday, and Rhodes said he was “optimistic” about the upcoming S&ED. 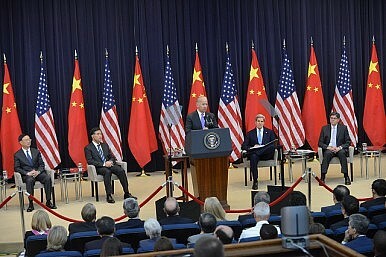 Rhode acknowledged the many differences between the U.S. and China, but said that “the key point” of the relationship is that the U.S. and China “can have differences, [and] articulate those differences publicly, but still find areas to cooperate.” Rhodes cited the ongoing P5+1 dialogue with Iran as an area of U.S.-China cooperation, and also referred to the economic relationship as an area with “space for… agreement and cooperation.” Rhode’s comments were highlighted in a short Xinhua article, more evidence that China wants to draw attention to the positive side of the relationship. Rhode also said that he expected a dialogue on cyber issues to take place, suggesting that China has agreed to restart the talks after canceling them in response to the indictment of PLA officers for cyber crimes. Daniel Russel, U.S. Assistant Secretary of State for East Asian and Pacific Affairs, expressed a similar attitude of optimism in his testimony to the Senate Foreign Relations Committee last week. Russel rejected the “mechanistic thinking” that conflict between the U.S. and China is inevitable, instead emphasizing the “resilient relationship” between the two. He highlighted the areas of cooperation on the agenda for the S&ED and spoke of “managing differences” when he addressed the sources of tension in the relationship. The positive vibes being emitted from both sides of the Pacific are part of a larger pattern. U.S.-China relations hit a rough patch in 2010, but both governments made a concerted effort to emphasize the positive in advance of Hu Jintao’s visit to Washington DC in January 2011. While neither China nor the U.S. show signs of budging on self-identified core issues (from Taiwan and Tibet to the South China Sea) that cause tensions, the constant use of mini “resets” in the relationship demonstrates that both governments want to keep tensions from rising too much, too quickly. There’s some truth to the old adage that U.S.-China relations can only be so good, but can also only get so bad. High level visits, in particular, generally spark a scramble to repair relations before talks begin. In this sense, the S&ED’s most useful function is its symbolism. The dialogue provides a high-profile example of cooperation, usually accompanied by a deluge of “fact sheets” and agreements highlighting the progress made on various issues in the past year. It’s a chance for both Washington and Beijing to demonstrate to their domestic audiences that they are properly handling the world’s most important bilateral relationship, and both sides are eager for the talks to go well. Thus the S&ED guarantees that at least once a year, the U.S. and China will put the best possible spin on their relationship. This was true even in 2012, when the S&ED famously took place on the heels of Chinese dissident Chen Guangcheng seeking asylum in the U.S. embassy. Instead of being cancelled, the 2012 S&ED was held up as an example of the resilience of U.S.-China relations: the dialogue continued as scheduled despite a tense (and unexpected) diplomatic situation. The purposeful optimism from Beijing and Washington suggests we should expect a similar vibe from this year’s S&ED.